15 Cutest Tricycles for Toddlers! Are you looking for a fun and super cute tricycle for toddlers? 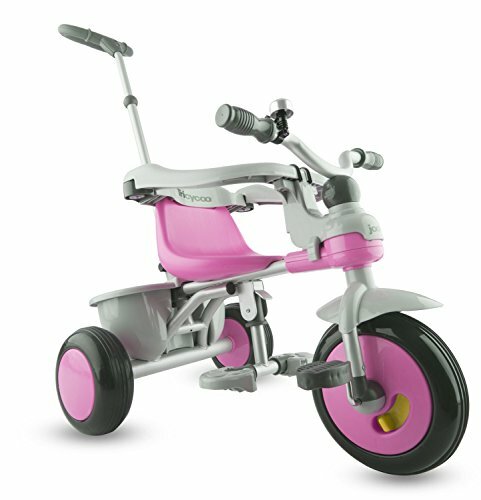 I can’t think of a better birthday or Christmas gift for your active toddler than a cute tricycle! I felt so important “driving” my own vehicle! Once I knew how to use the pedals properly, my father would take me to a nearby park and I rode my tricycle like I owned the world! Tricycles make great childhood memories as well! I think they are almost like a rite of passage! 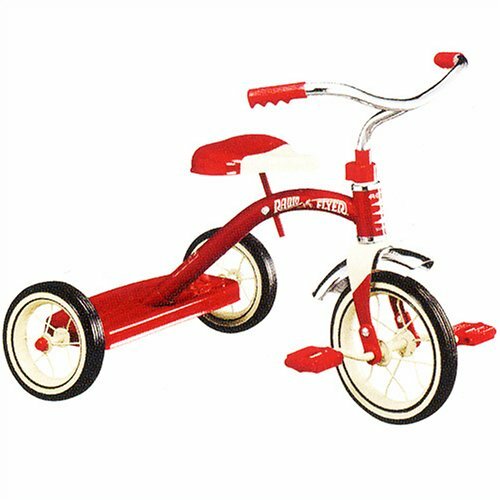 Do you remember your first tricycle? 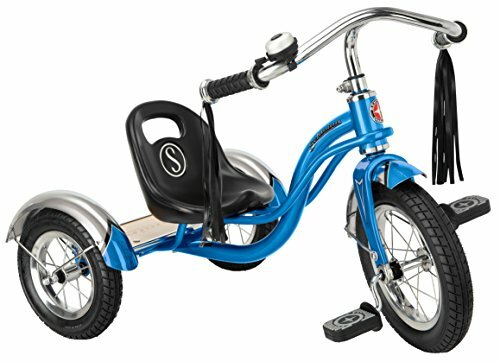 *How awesome is this 12-inch ‘hot blue‘ toddler trike for sale in the picture? You can also get it in many other fun colors!! A child’s first tricycle will be one of her or his most important childhood memories! It is kind of a rite of passage for a toddler to start riding his own tricycle………He understands he is no longer a baby and that he can start doing things on his own……. It is a very liberating feeling! At around two years old, we start realizing we are individuals and separate from our parents and other people……..
What they call “the terrible twos” is actually your child understanding he is a person too! With his own needs and wants! So when you choose your child’s first tricycle, it should be the cutest tricycle in the whole wide world! Perfect Trike for 2 Year Old Boys! 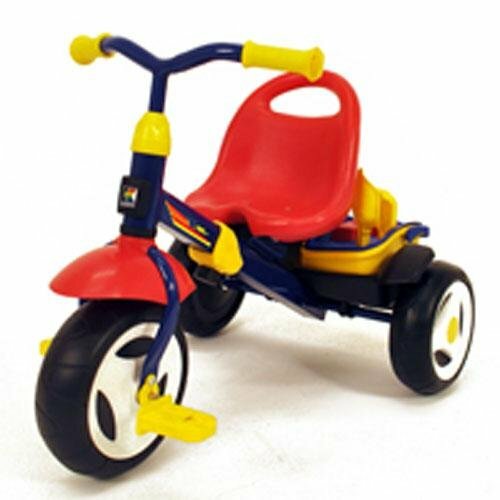 Toddler trikes are usually the very first riding toy of their lives! Parents and grandparents love giving their one year old kids a cool tricycle! But which ones are the best ones? Nowadays there are hundreds and hundreds of options! The best tricycles for toddlers are the most durable, heavy duty ones, that will fit them at least for a few years. I also love the cool Italtrikes, which are beautiful and very unique toddler tricycles made in Italy! I gathered here a few of the best rated top selling cutest tricycles for toddlers based on their looks, quality and overall satisfaction by parents! The cute and colorful toddler trike you see on this picture is perfect not only for 1 year old children, but it also fits them up until 4 years old! You won’t have to be buying trikes every year! As you can parents can also push their toddlers when they are still learning how to use their first tricycle! This is a very cute toddler tricycle! Great first or second birthday gift idea! This cute Joovy tricycle is perfect for toddlers 18 months old and up! 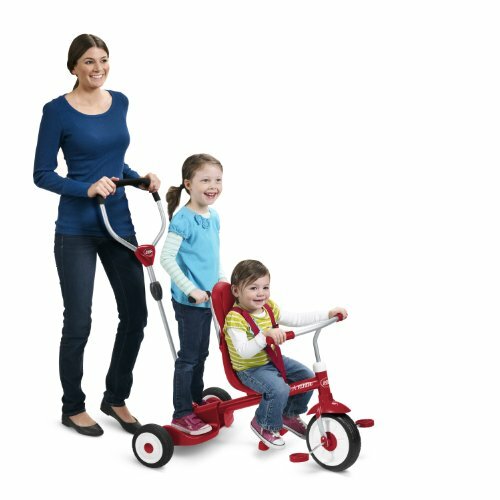 As you can see in the beginning parents can push them using the practical removable handle and when they are ready to ride on their own just remove the handle and unlock the pedals! This pink trike is just perfect for your little girl’s first birthday! You can also get it in orange or green! This is one of the top reviewed toddler trike by parents who all agree it’s fun, great for learning how to ride and it runs fairly smoothly! Kids also like to be pushed by their parents when they get tired! 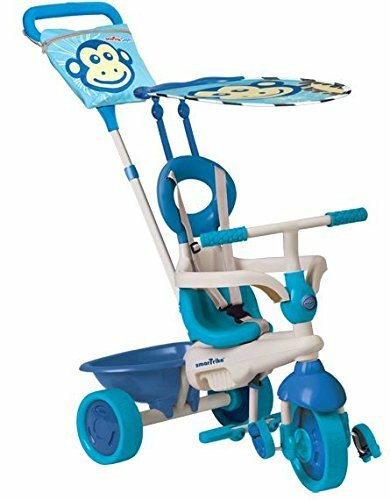 Cute Smart Trike Safari Tricycle from 10 Month Old Toddlers and Up! Best Push Tricycles for Toddlers! Smart Trikes are definitely among the top push trikes for babies and toddlers! They are very comfortable to use, (maybe even more comfortable and fun than a stroller! ), they also ‘grow’ with your child and the high handle is perfect for moms and dads to push their little ones someplace fun! This one offers awesome back support and the cute monkey themed sun cover is a nice plus! Best Tricycles for 1 and 2 Year Old Kids! 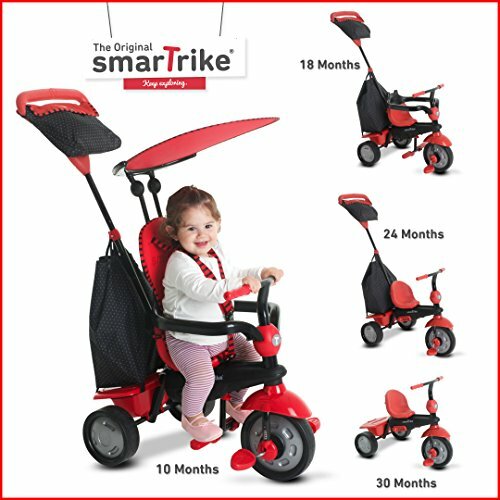 What a gorgeous red color 4 in 1 Smart Trike for toddlers! The 4 in 1 means there are 4 ‘stages’ for the little ones: the first stage is for when they are 10 or 11 months old, and parents use this almost like a stroller, pushing them. The second ‘stage’ is when they are about 18 months old and they are learning how to use the pedals, but the parents still help and push them, as they get tired easily. Stage 3 and 4 is when they are about 2 and 3 years old and can ride this trike all by themselves! I also love the huge toy bucket in the back! 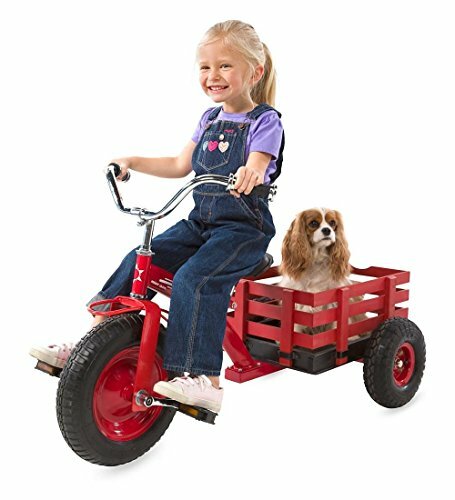 Best Toddler Fun Riding On! 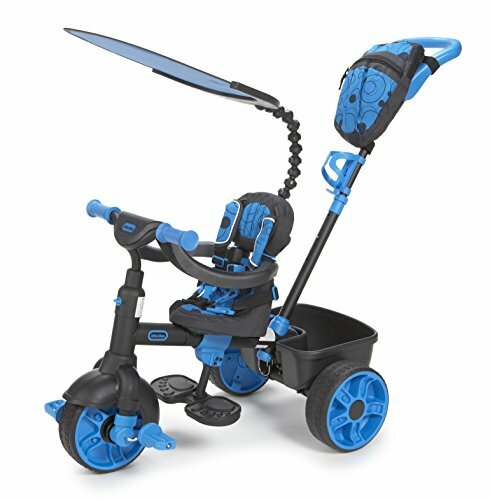 This Little Tikes 4 in 1 gorgeous neon blue toddler trike also comes with a canopy and push handle for the parents. As you can see the seat is also all padded, to keep your little one nice and comfy while learning how to ride his fun trike for the first time! The seat will adjust to 4 positions and that’s why it fits toddlers as young as 9 months old up until about 3 or 4 years old. This one will last a long time, because it “converts” from baby tricycle to a full independent tricycle, whenever your child is ready…. It is a very nice first tricycle for them! It is very durable and very easy to put together! 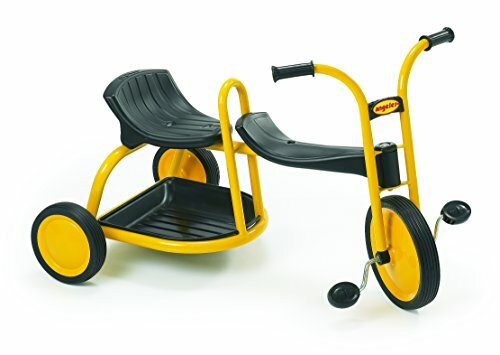 Fun Yellow Tricycle for TWO Kids! How gorgeous and FUN is this yellow trike for TWO kids ages 3 and 4 to about 6 years old? It is very stylish and ultra-cool and unique! I bet your little one will be the only kid on the block riding this double rider yellow tricycle! Cute Trikes for 3 and 4 Year Old Boys or Girls! This one is absolutely perfect for your future fire fighter little boy! Boys love to pretend they are fire fighters! 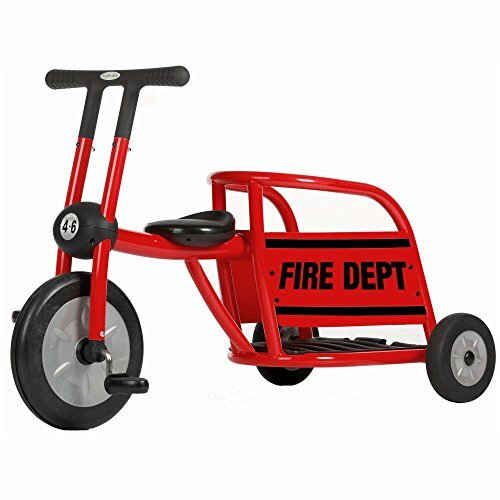 Who is the lucky 3 year old little boy or girl who will be riding this amazing red fire truck steel tricycle soon? He can also take a friend standing in the back! This is a very unique tricycle! It fits little ones ages 3 to about 6 years old! It will make the most awesome Christmas gift idea for a 3 or 4 year old boy or girl! Gorgeous Double Seat Italtrike Tricycle for Toddlers Ages 2 to 4 Years Old! This one will be perfect for twins or siblings! They can take turns being the designated “driver”! 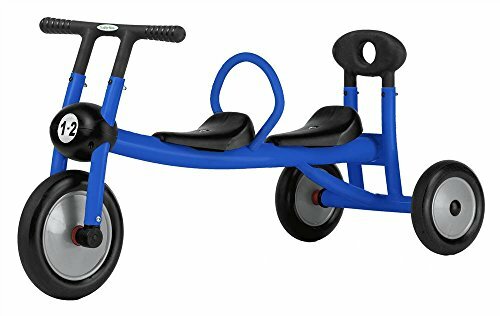 This double seater tricycle for toddlers is one of the best Italtrikes tricycles for twins! They can each take turns in being the assigned ‘driver’ and the other seats in the back! It is gorgeous, fun and sturdy! The seats are nice and comfy, and each has a backrest too. 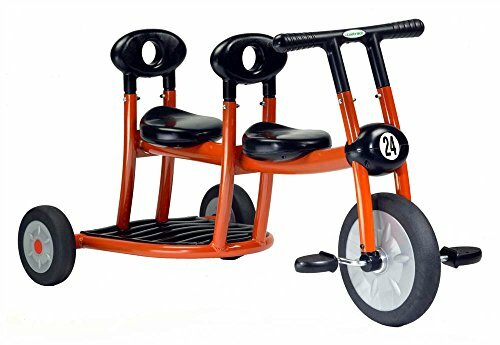 If you have twins or two toddlers at home, I think you just found the perfect tricycle for them! I wish I could try one of these too! They seem to be so much fun!! This is one of the cutest double trike for 1 and 2 year old kids! There are no pedals, so it’s all about their ‘foot power’! Great for 1 year old children just learning how to walk! Also perfect for twins or siblings close to age! It is a great way for them to learn how to play together and share the ‘driving seat’! 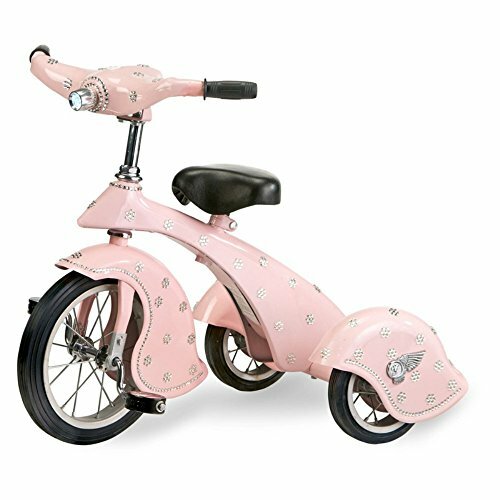 Morgan Cycle Cute Vintage Pink Steel Tricycle for Little Girls! How cute and absolutely adorable is this pink retro trike for your 2 year old little girl? It also comes with working headlights! Just picture her riding this beauty! Another Cute Vintage Style Tricycle for 2 Year Old Children! What a gorgeous vintage style red tricycle! It comes with a “real” working headlight! Your child will feel very important riding this beauty! 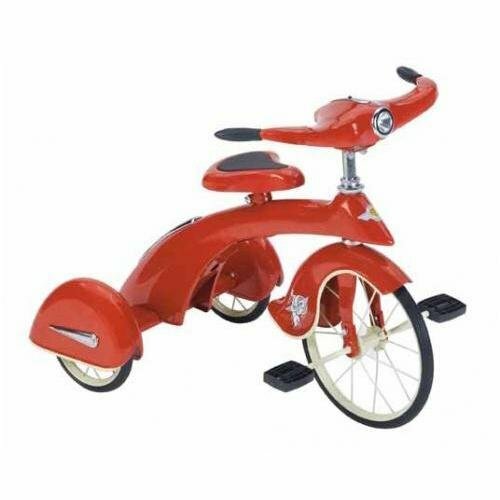 A cute vintage tricycle for toddler boys or girls! Radio Flyer Classic Red Trike for 2 and 3 Year Old Kids! One of the best trikes for toddlers ever created! I had a blast riding around my house! It’s very sturdy, fun and spacious. I love the nice handlebars as well! Very Unique Toddler Wooden Trike Wagon with Toy Storage! It fits little kids ages 3 years old and up! Great exercise for them too! *I hope you had fun here choosing a cute tricycle for your toddler!